Accessory Genie - Consumer Electronics and Accessories Industry News: Black Friday is Coming! It’s almost that time of year- Black Friday is coming! Why waste your time in boring lines? Why risk bumps and bruises from crazy shoppers? Accessory Genie is offering you all the Black Friday deals without any of the hassle. With numerous items being dropped to ridiculously low prices, this will be your most Genie-ous Friday yet! Kick off the holiday season with incredible prices and awesome savings! We are marking down some of our top sellers for one day only. Whether it be speakers, headphones, lanterns or power adaptors- we got you covered. The GOgroove SonaVERSE CRS Computer Speakers originally $29.99 now only $19.99! Housed in a clear acrylic shell, the CRS is constructed to add classy taste to any home, office or dorm setup. The GOgroove AudiOHM Real Wood Earbuds originally $24.99 now only $15.99! With a real wood housing, these earbuds have been masterfully crafted to deliver superlative sound in the smallest packages. The ReVIVE PowerUP Q4 AC Wall Adaptor originally $17.99 now only $14.99! The lightweight, compact design makes the Q4 an ideal travel charger. The ENHANCE NightLUX EXP Hand Crank Lantern/Flashlight originally $19.99 now only $14.99! Perfect for indoor, outdoor and emergency use, never worry about batteries again with this lantern/flashlight combo. The Gogroove BlueSYNC BR2 Portable Bluetooth Speaker originally $29.99 now only $24.99! This portable sound bar design, with a blue accented grill, adds a modern look to any home or office. 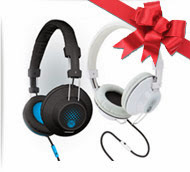 The GOgroove AudioLUX OE Stereo Headphones originally $29.99 now only $24.99! Made with noise isolating over-ear design, enhanced bass, and hands free microphone, these headphones make listening to your tunes for hours on end a comfortable and satisfying experience. The best deal of all is FREE SHIPPING on EVERY purchase this Friday ONLY!!! Just enter the Coupon Code ‘BLACKFRIDAY’ to receive the discount. Black Friday ends Nov. 29th at 11:59pm PST.